Home > Eu Initiatives > Reports > Are EU companies adopting digital technologies? The 2018 Digital Transformation Scoreboard shows that the uptake of digital technologies by businesses is increasing. Equally, more EU countries perform above the average in the integration of digital technology. The United Kingdom, Spain, Denmark and Luxembourg are the most digitally-aware European countries. Improvements are necessary for some eastern and southern states. Every year since 2016, the Digital Transformation Scoreboard studies the uptake of digital technologies in businesses across the EU. This year’s exercise surveyed companies in two particular sectors: construction and food. The outcomes of the survey show that in both sectors more than 70% of the companies have invested in digital technologies to improve their production processes. Consistently, almost 90% of them declare to be fully aware of the new prospects of the digital revolution. This year’s novelty is the Digital Pulse. The new feature uses media analytics to assess the uptake of Industry 4.0 technologies. The information is collected from open sources, such as online press, blogs, social media channels, broadcast television, etc. The data collected by the Pulse covers billions of web conversations from 150 million sources in 187 languages. It concluded that cybersecurity, blockchain and artificial intelligence are the three most popular technologies in 2017. For the 2018 Scoreboard, 19 national digital transformation policies and programmes were analysed. All of them demonstrated the key role of industry and research stakeholders in backing these policies. The report also concluded that almost two thirds of EU countries have prioritised the digitisation of their industries. This has generated large-scale policies and initiatives to increase productivity and competitiveness, including the improvement of workforce digital skills. While the need for a digitally advanced industry seems to be consensual across the EU, policies and their implementation at national level are really diverse. All projects have common goals but differ in core aspects such as design, funding approach and size. Learn more about the integration of digital technologies by businesses. 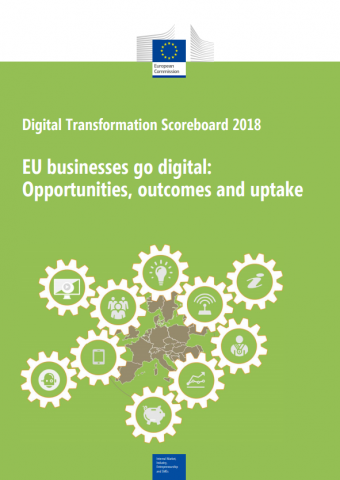 The Digital Transformation Scoreboard is funded by the EU programme for the competitiveness of small and medium-sized enterprises (COSME).